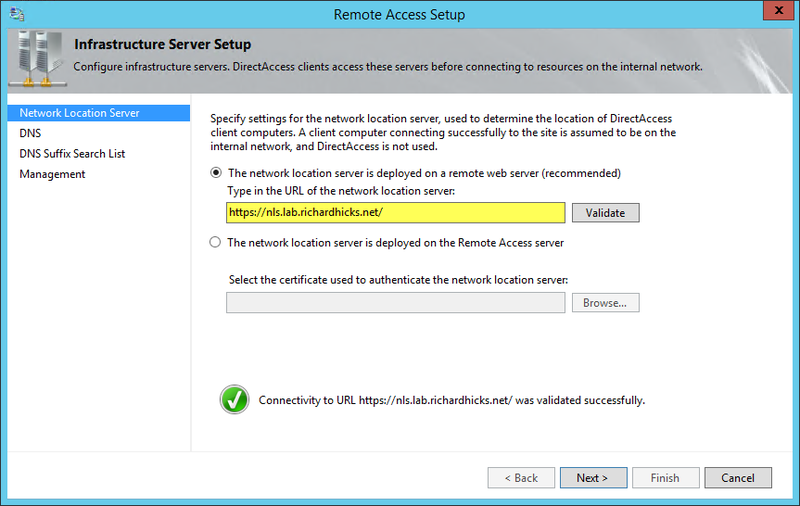 DirectAccess Network Location Server Guidance | Richard M. Hicks Consulting, Inc.
How can deploy multiple Network Location Servers for a single Direct Access 2012 R2 solution? I cannot seem to find any tutorials on how to do this. Is it possible to do this? I don’t mean NLB but rather having more than one Network location server. Thanks. Yes it is possible. If you fx have several sites connected with unstable WAN connections it can be a good idea to have a NLS server at every site. You only need to make sure that the local NLS site is pointed to by the local DNS. Thanks for your reply gents. So what I gather is there is a “simple” way to do this as DirectAccess itself does not natively support this functionality but rather you have to use the DNS record to allow for multiple “hot standby”, if you will NLS servers. In the event that the primary NLS server goes down for some reason you would have to manually change the IP address of the NLS DNS record. Would it be simply enough for them to each have their own internal CA issued SSL certificate? If the CRL lists for the certificate is hosted on the internal CA, by default, should that be enough if it is available? Another thought I have is if there are DA clients at WAN satellite offices without an NLS server the WAN goes down that would cause problem. There are a number of different ways in which NLS availability can be addressed, really. Using NLB is quick and simple, but doesn’t provide for geographic load balancing. This becomes an issue for clients in a remote location if the WAN link goes down. Depending on your DNS configuration, you could use round-robin DNS and netmask ordering should connect clients to a local NLS. And, as you mentioned, you can do this manually by updating DNS entries. If you choose that route, I’d suggest using a very short TTL on that DNS record. CRL availability shouldn’t be an issue with internally issued certificates. I have a solution for the WAN satellite sites. I am not sure if it is best practices but as I see it, it will work. DA clients in a WAN satellite need to be able to access two resources to be able to function normally (DirectAccess wise). 1. They need to be able to access the CRL lists for the certificate used on the NLS site. In the case of a WAN link is down those resources must be accessible locally on the satellite site, otherwise the clients will not be able to access local resources. When issuing a certificate for the NLS site at the internally CA make sure that the CRL lists for the NLS certificate are published to the AD. That way the CRL lists will be replicated to a local DC on the satellite site. The next thing is to make sure that the NLS site is available even when the WAN link is down. The clients should then be configured to use the local DNS as primary DNS and a central DNS server as secondary DNS server. As long as the local DNS server is up and running the clients will then use the local NLS server. If DC is down then the central DNS will be used and therefore the central NLS site will be used. Now to the part that might not be best practices. We could place the local NLS site on the local DC. This means that the local NLS will be down when the local DNS is down and therefore the central NLS will be used (if the WAN link is not down as well). The above-mentioned solution might not be beautiful but I think it will work and ensure that local resources can be access from DirectAccess clients even when the WAN link is down. An important thing to notice is that the CRL lists for the NLS certificate should also be available otherwise the NLS certificate will be seen as invalid and the NLS will not work. Do you believe it wise to join servers of two different network zones (difference is in trustlevels granted to each zone) using Direct Access to our internal AD Domain. I don’t read that Direct Access is build for this purposes. What do you believe the risks are ? That’s certainly an interesting use case for DirectAccess, and one I’m sure is not common. DirectAccess is designed as a client remote access solution, but I don’t see any reason why it wouldn’t work though. Windows Server 2008R2 and 2012/R2 are both supported clients after all. However, it might be simpler to use IPsec as opposed to implement a DirectAccess solution for this. Quick question, with the pending depreciation of SHA1 certificates do you know if the nls certificate will be impacted? Does it need to be upgraded to SHA256 signatures? At some point yes, but I don’t think you’ll have to worry about it for the foreseeable future. One question though, the person that configured our DA deployment put the nls url in the DNS suffix name list without a DNS server specified. Essentially, DA clients are unable to reach the NLS server after they have connected. Is this a normal configuration? My NLS is currently collocated on the DA server but I’d like to move it. Is this going to affect my internal users when I make the change, or will they just pick up the change automatically.? Moving the NLS from the DirectAccess server to another dedicated server can be potentially disruptive, yes. When you update the DirectAccess configuration to reflect the new NLS location, the NLS running on the DirectAccess server is removed immediately. If a client comes online before receiving the new configuration via group policy, it will be unable to connect to local resources. To avoid any outages it is recommended to keep the NLS URL the same. This can be challenging if the NLS URL is the name of the server though. I’m actually working on a blog post that talks about this very scenario. Hopefully I can get it published soon. Stay tuned! Great article and usually never have an issue with the NLS config. But this time my customer NLS fails on the operations Status. When running the PS cmd “Get-DANetworkLocationServer -Checkreachability” the Reachability comes up false. It provides no reason. I can ping /resolve the NLS URL in my user context. The Web server firewall is off. I found and applied KB3047280 with no effect. Clients fail too if they get the DA GPO’s when the DA host is configured with the external NLS. If I configure the DA NLS to point to its self it all works. You have any advice how to troubleshoot this issue? Unusual. Assuming when you browse the NLS server it returns a web page of some sort? Either the default IIS start page or something else? We are having an issue at the moment with our Direct Access deployment. We have setup two Direct Access Servers, one setup as Edge whilst the other is setup as behind an Edge device. Reason for this is because we wanted to get Teledo working, although that never seems to connect. Always goes to IP-HTTPS. We have setup one of these Direct Access servers as the NLS, and the other DA server points to this. I can ping the NLS URL internally. Problem is the DA clients are connecting to DA whilst on the corporate LAN when they should not be. Surely they should be disconnecting? Any ideas what this could be? Hi this may be a very silly question but, Should the NLS only resolve internally? Is this something that can done without disruption to my users? I was thinking that if I reduce the TTL on the DNS record for the NLS a few days in advance and then change the IP over a weekend it would be OK. I can see a reference to the NLS IPv4 address in the DirectAccess Policy-ClientToNlaExempt group policy setting so after the IP change I would run through the DA setup wizard and validate the NLS location to which would hopefully picking up the new IP address and then I’d commit that change and push out the updated Group Policies. The internal clients will be then be able to connect on the Monday morning when they refresh group policy. I’m expecting this change not to effect externally connected clients. For the DA server internal addresses I would change the IPv4 address and DNS servers (because I’m re-addressing the domain controllers too) on the NIC then in the RA Mgmnt Console go to each server under Enterprise Direct Access -> Entry Point -> Servers and click on “Configure Server Settings” and hopefully see the new IPv4 address and and DNS servers. I’d then commit those changes and push out the updated Group Policies. Does this sound correct or am I over-simplifying it? Hi Craig – Changing the IP address of the NLS is easy enough. Yes, it is a good idea to reduce the TTL on the NLS DNS record to minimize disruption when making the change. However, changing the IP addresses of the DirectAccess servers themselves is likely going to be problematic. In my experience, changing the internal IP address of DirectAccess servers after it is configured often produces poor results. I’ve seen times when it works fine, but other times DirectAccess quits working entirely. If you are looking for a way to do this without interruption, I would recommended deploying new DirectAccess servers with in the new IP subnets and migrating clients to those. Ouch. That sounds a bit painful. We are under some very tight timelines so don’t really have time to build new servers. If you change the internal address and it breaks can you just go back to the original address to fix it or does the change break DA permanently? And if it doesn’t work I guess my only option is to remove the server/entry point via the DA wizard, re-IP the server and then re-add it again with the DA wizard? With the NLS can I just change the IP and update DNS or should I run through the DA wizard and verify the NLS after making the change? Thanks Richard, much appreciated. Wish me luck! Hi Richard!. Thanks so much for all your guides they are a god send!. I have an issue i was wondering if you could point me in the right direction as im scratching my head. We already have an existing DA server setup and I am building a new one along side seperate so we dont disrupt existing testing. “The subject name of the network location server certificate does not resolve correctly. Ensure that the name resolves to the IP address of the internal network adapter of the server. I only got a single NIC on here which has both IPV6 and IPV4 address. I have checked, i can ping, the subject name is correct, DNS entry Host A Record is present too and it has the IP address of my DA server. What could i be missing?! Thanks Richard, i found out what this was and something i left out of my scenario that this is a child domain and the parent domain CA issued the Cert and it didnt like that despite the cert having the matching common and subject name!. Is there any way of changing the “directaccess-corpConnectivityHost”. When i apply my new config despite changing the GPO names and NLS DNS name, and web probehost, it stops the existing from working?! Could that be to do with the fact that there are multiple “directaccess-corpConnectivityHost” entries with different IPs? If you are using IP-HTTPS only you can safely disregard the directaccess-corpConnectivityHost DNS entry. That’s only used for 6to4 and Teredo. It has no impact on DirectAccess operation for IP-HTTPS only deployments. The directaccess-WebProbeHost record is crucial however. It should resolve to a web server listening on TCP port 80. It can be an internal web server or any of the DirectAccess servers too. Your choice. Uninstalling and Removing DirectAccess | Richard M. Hicks Consulting, Inc.
DirectAccess NLS Deployment Considerations for Large Enterprises | Richard M. Hicks Consulting, Inc.